Posted 10/17/2017 3:06pm by Jeff Schrimmer. We will host several more events at the farm this fall. These will all be opportunities to see the farm, help out a bit and to receive a pumpkin. Harvest Festival- Saturday, October 21st, 11 am ‘til ? and Sunday October 22nd, 11 AM until 4 PM. Saturday will be the main event, with Sunday as a rain date or for anyone who cannot make it on Saturday. This will be similar to the spring event. It will be potluck for lunch, there will be grills available for cooking. Members can begin arriving after 10 am. I will give 2 farm tours- the first at 11:30 and the second at about 2 PM. If there is interest we can do some pumpkin painting or carving for the kids. Also if there is interest we will build a fire at the back of the property and have a campfire sing-along. Bring your acoustic instruments and your voices. Bring your own food and beverages. We will provide apple cider. Take home a pumpkin. Sunday November 5th, 11 am- Come out and help prepare the garlic for planting. This will be done inside the barn, so it will be rain or shine. If there is interest and the weather permits I will be happy to show folks around the farm in the afternoon. Posted 10/17/2017 2:57pm by Jeff Schrimmer. Today in addition to harvesting for the Tuesday deliveries, we spent preparing for another cold night. This will be our first hard frost and will likely finish off most of the tender crops such as the peppers, eggplant, beans and summer squash. We have covered as much as we were able to try to keep them alive for a few more weeks. This will be a single cold night after which it will warm up again for a week or so. The sweet potato vines will certainly be killed and we can begin harvesting them in earnest. They will be featured in most if not all of the shares remaining in the season. The spinach crop is now large enough to cut and highly tolerant to cold, so it too will be abundant through the final weeks of the season. Cauliflower is heading up and we will be including them in the shares over the next few weeks. We also have lots of beautiful carrots for you to finish out the season! As I have been hinting the season is winding down- just 4 weeks left after this week. I have sent out the information on the end of season stock up share. This is an opportunity to continue eating quality local produce well into the winter and to support your favorite farmer (I hope lol). Please RSVP ( kruegerjohn@earthlink.net ) if you plan to attend the farm event this weekend, so I can have an idea of what to expect. I especially need to know if there is interest in a campfire on Saturday night as this requires more planning. Posted 10/10/2017 9:24pm by Jeff Schrimmer. Please note that we have attached Farmer John's Fall Farm Event schedule to the bottom of this update. As I write we are receiving some much needed rain; hurricane rain but without any damaging winds. This will be of great benefit to the greens and the fall brassicas which have been slowed down by the dearth of precipitation through most of September. We have some spinach that is sizing up and may be ready to begin harvesting next week. We also have a lot of broccoli planted which will be heading up through the rest of the season and cauliflower should be starting soon as well. We will be offering several more chances to visit the farm this fall, beginning this Sunday with a volunteer day to help us bring in the rest of the winter squash crop. 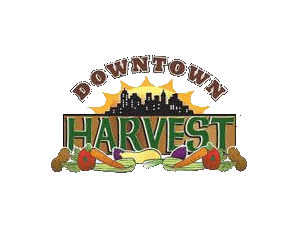 On October 21st and 22nd we will host a fall harvest event. More details to follow. Sunday October 15th, 11 am. Come out and help with the winter squash harvest and be rewarded with an ornamental or edible pumpkin. Posted 10/3/2017 1:49pm by Jeff Schrimmer. So you may have noticed I haven’t had much to say about the weather for the past few weeks; a deviation from the norm since most of my updates begin with a weather report. I jokingly refer to it as griping about the weather but it’s really meant to help the members understand what we are up against and in what ways the weather affects our production. With the devastation caused by Harvey and then Irma and now Maria it didn’t seem appropriate to utter a single word that might be construed as complaining. Besides, the frequent rain had ceased and after a cool beginning September warmed up nicely. So at this point it hasn’t rained (except for a bit of drizzle) for over 3 weeks and the heat wave we had at the beginning of last week actually damaged some to the acorn squash, leaving white sunscald marks. We have had to move the sprinklers around to get the last round of seeds I planted to sprout. I always tell folks that out here in the highlands of Northwest NJ we can have a frost as early as October 1st. As I watch the long range forecast carefully, I was expecting our first frost this year around the 22nd or 23. Imagine my surprise when today I spied the blackened leaves of the sweet potato vines. On closer inspection I saw that the basil too had been singed as well and there was some damage to the beans and summer squash. It was a very light frost but a frost nevertheless; and completely unpredicted and unexpected. But it will gradually warm up again over the next week or so until the next big dip and we may get some much needed rain early next week. So I ain’t complainin, I’m just sayin! As farmers we are accustomed to making the most of whatever Mother Nature gives us! Posted 9/26/2017 3:00pm by Jeff Schrimmer. So as we head into the fall we will be transitioning back into cool weather crops, but for now we are still abundant with summer veggies. Next week we will begin to have broccoli again and we will start to ship some of the winter squash in the shares. We have a nice crop of fall carrots coming along, but we will give them one more week to size up. We have salad turnips for everyone this week. They are great either raw or cooked and have beautiful greens. The potatoes for this week are a variety called Adirondack blue and have a blue flesh. I just read an article about their potential to prevent colon cancer. The skin is rather scabby (this variety is more prone to that problem) so you may want to peel them. They also do not keep as well as other varieties, so enjoy them soon. Also, if you have a bagged share and receive them in a plastic bag, you should transfer them into a paper bag or an open container. Potatoes should always be stored in a cool, dry, dark place. Never leave them exposed to light, even indoor lighting because they begin to turn green, producing a compound called solanine which can cause chronic toxicity. The share for this week will be: Beans, colored peppers, eggplant, potatoes, summer squash, choice of arugula or tatsoi (mostly arugula), red onions, choice of cilantro or parsley, lettuce and salad turnips. 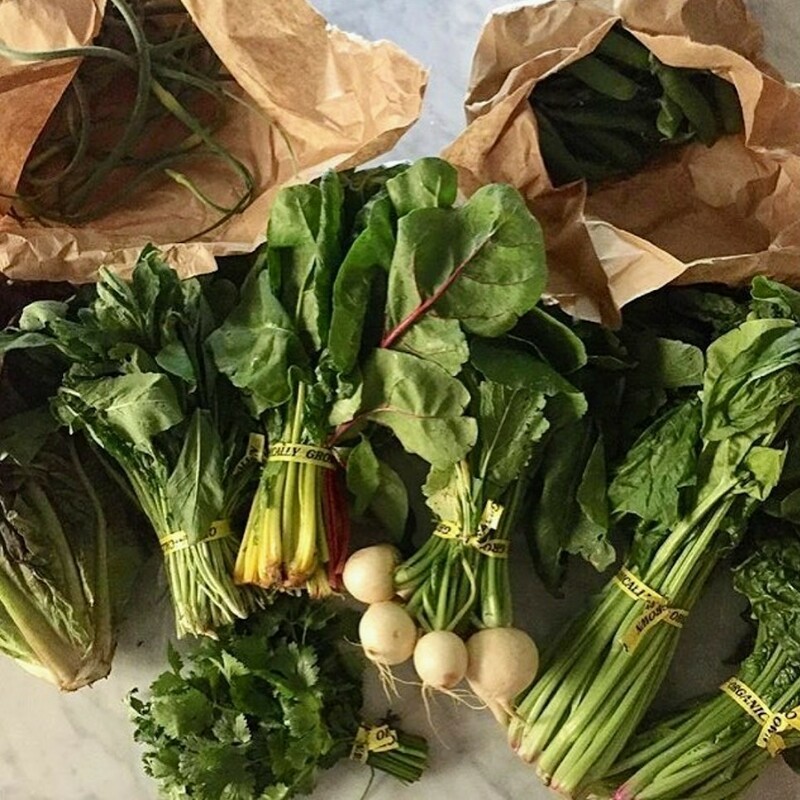 Premium shares will include radishes, chard and a choice of escarole or endive. Posted 9/19/2017 1:41pm by Jeff Schrimmer. So you might think that by now things would start to ease up a bit here on the farm and I would have time to write these updates and get them out to the members in a timely manner. But it never really slows down much until November. We are still busy transplanting fall crops such as lettuce and direct seeding other crops like spinach and radish. We are cleaning up fields that have produced their crop and planting oats and peas as a winter cover crop. And we are preparing ground for planting garlic which goes in the ground in late October and early November. We still have an acre of sweet potatoes to dig and 4 acres of winter squash to bring in. I recently purchase a greenhouse frame from a local farm that is getting out of the vegetable business. Yesterday we went to pick it up and transport it back to the farm. We had some problems which resulted in me not getting home until 10 pm; tired and hungry! Even as the work involved with this season’s production winds down there is always much to do to prepare for next year. Posted 9/12/2017 5:10pm by Jeff Schrimmer. We have another nice share for you this week, including another round of sweet corn. Last week the corn we sent was Silverqueen, an old standard variety. This week we are sending an heirloom variety called Luther Hill. This is a variety that is well renowned in the tristate area, with it’s fans known for seeking it out. It was actually one of the parents that were used in creating the hybrid Silverqueen. It has rather small ears but boasts excellent flavor without the cloying sweetness of the new supersweet hybrids. A few groups were shorted their Silverqueen last week and will receive it this time around and the Luther Hill for next week. Everyone will receive some corn at least twice this season. We have one more planting but it is uncertain how well it will yield. There is a low incidence of earworm but it is still possible you may find one on the tip of some of your ears. We are also sending watermelon to most of the groups that have not yet received any. It is not as sweet as I would have liked, but we have had a bit of a heat/sunshine deficit this season. We are also buried in beans at present; there will be a lb. for all and extra for premium share members. The ones with the purple streaking are heirloom varieties- Rattlesnake (green) and Dragon Langerie (yellow). In case you are overwhelmed by the bean bounty keep in mind that beans are easy to freeze. They need 1 minute in boiling water or steam to blanch them, then into ice water or running cold tap water to stop the cooking process. Then toss them into a sealable bag and you will have beans to use this winter. Blanching is important because it destroys enzymes which breakdown vitamins and turn sugars into starch. We are announcing several opportunities to visit the farm in the coming weeks. The first will be this Sunday 9/17, a farm visit we are hosting in conjunction with Local Harvest to observe National Gleaning week. Local Harvest is a group that works with local farms to collect their culled and excess produce for distribution to food banks, pantries and soup kitchens. Gleaners are volunteers who help harvest un-needed produce that would otherwise go to waste in the field. The event is from 11 am until 4 pm (or as long as folks want to hang out). It will be a potluck barbecue, featuring farm tours, gleaning and maybe some live music. The share for this week will be: Parsnips, lettuce, eggplant, summer squash, beans, colored peppers, choice of arugula or tatsoi, leeks, fingerling potatoes, choice of cilantro or parsley and sweet corn. Premium shares will get shallots and extra beans. Posted 9/4/2017 9:11pm by Jeff Schrimmer. Happy Labor Day! I hope you enjoyed it however you spent it! Of course there’s no day off for us here on the farm- the show must go on! My workers don’t mind- they are here to work and earn money to help their families. And I get my vacation time in the winter. Speaking of winter… it feels like it will be here soon! We have had a few very chilly nights up here in North Jersey. The long rang forecast doesn’t call for frost until sometime in Mid-October; I hope that will be the case. The fall crops are loving it and the warm weather crops are hanging in there (excepting the melons and tomatoes, which were done in by the rain. A few groups got some sweet corn last week; most of the rest should have some this week. We are still working on getting a watermelon to everyone. That should happen this week or next. We have beautiful beans and beets with greens for you this week. If you haven’t before, try using the tops this week- they are good quality and really nutritious. We have lots of nice cilantro and a small amount of dill for those who can’t abide the former. Summer squash is on hiatus for now but we have another planting which should start coming in soon (now that we have fenced it off from the deer). Posted 8/28/2017 8:53pm by Jeff Schrimmer. So I have some good news and some bad news; which would you like first? The bad news you say; well it seems we will have a short melon season. The rain was just too much for these delicate plants- the first planting did not produce a second crop and the second planting is probably not going to produce much of anything. The watermelons are a little hardier and we will be trying to get some to all groups that have not yet received any, over the next 3 weeks or so. The good news is that we are back in lettuce harvest mode, and should have it in the shares for most of the rest of the season. We are also beginning to pick from the second planting of beans, so beans should be abundant for the next month. We have reached the midpoint of the season, having completed 12 weeks of deliveries. As we move into the back 12 (that’s like the back 40 in farmer talk or the back nine if you are playing that game with 18 holes) we will be returning gradually to the cool weather crops. We will begin to have more greens and we will soon have broccoli, Napa cabbage and kohlrabi again. We also have sweet potatoes, parsnips and winter squash to look forward to. We are also waiting on a large planting of Silverqueen sweet corn to mature, so there may be a few ears for you this week and if not than likely the next. Please be aware that some may have a worm at the tip (that’s how you know it’s organic right? Lol). Posted 8/22/2017 11:15am by Jeff Schrimmer. The share for this week will be: tomatoes, peppers, eggplant, gold potatoes, leeks, summer squash, choice of green or red cabbage, string beans, beets and choice of kale or chard. Premium shares will include cucumbers and parsley. Some groups may receive melons or watermelons and we will be in rotation with these over the next several weeks.